Formerly developed by Rockstar and now, apparently, under the roof of bam! entertainment, street violence game State of Emergency 2 will be released this Summer. Someone sent us a link to this commercial, created by a company called The Phage, promoting the game which, according to a source at The Phage who recently posted the ad, was created a year ago. The source says Rockstar is still a client of The Phage but would not go into details as to why his company appeared to be promoting a game that is no longer "owned" by their client, Rockstar. Either there's some weird politics going on or, perhaps, bam! entertainment and Rockstar are combining forces in some way. We'll let the game blogs figure that one out. 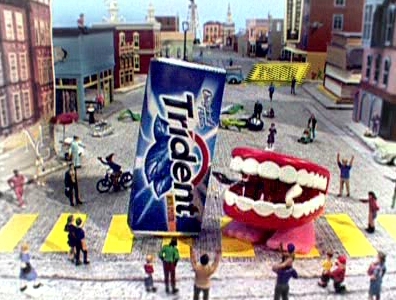 Sure to grab the attention of denture wearers, dental-phobics and kids prone to nightmares, this new commercial, one of three from Trident which feature a character called Little Mouth, will debut tonight during ABC's Lost. As the open source underdog browser, Firefox, continues to steal market share from Microsoft, it, with help from European POZZ agency, has launched three hilarious news spots that illustrate the increased joy Firefox offers people over dull and boring Internet Explorer. Today, GE will launch a new corporate campaign, called "ecomagination," touting its eco-friendly approach. A multimedia effort will kick-off with eight-page newspaper inserts in The New York Times, The Wall Street Journal, Washington Post and Financial Times. Thereafter, print, television and online ads will appear. For print, there are two pools of work: one modeled after the look of the famous Audubon prints; and another that uses reflection and shadows. Both are intended to show how GE products co-exist in harmony with nature. Television commercials speak to GE's technology that claims to do the job with greater fuel efficiency, lower emissions and less noise. But, the really fun (and controversial) element of this campaign is the spot called Model Miners in which perfect bodied male and females toil, to the tune of Merle Travis' Sixteen Tons, in the depths of a coal mine while glancing seductively into the camera. A teaser spot with a dancing elephant called "Singing in the Rain" broke last week. Additional commercials will break this week. There is also an interactive online component that was created by Atmosphere BBDO. This very simple yet powerful commercial for a cause revealed at the end of the it, makes, according to adland's Ask Wappling with whom we agree, the best used of digital pixelation seen in recent memory. To view the spot, you have to register and pay ($2-3 per month). Now, don't complain. Unlike Adrants where bills get paid by ad revenue, adland derives its revenue from subscriptions. We all have to make a living somehow. Once you do sign up, you will have access to something on the order of 20,000 television commercials. About 20 new commercials are added each week. In this brilliantly concepted commercial, Blaupunkt illustrates the body shaking thrust of its automotive sound systems by showing the effect it has on two stuffed animals sitting on the back shelf of a car. Of course, it could always be a brand hijack. UPDATE: Apparently, and not surprisingly, this spot was not authorized by Blaupunkt for release. 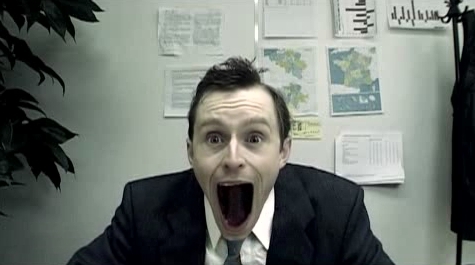 Also, downloads have killed bandwidth here so the link is dead. The commercial is available here, here and here. We saw these floating around before but, for some reason, never wrote about them. Well, people keep sending links so we guess it must be important. And, it is. These three spots, one for each British political party (labor, Conservative and Liberal Democrat) were created by none other than Lee Ford and Dan Brooks of Lee and Dan VW Polo Suicide bomber fame. Each of these three spots, created for Britain's Channel 4, deliver each party's message in a very straight forward but fairly non-political manner. One of the spots, which features a woman waking up, confused, the morning after, in bed next to a stranger who claims she promised herself to him for the next for years really hits home.